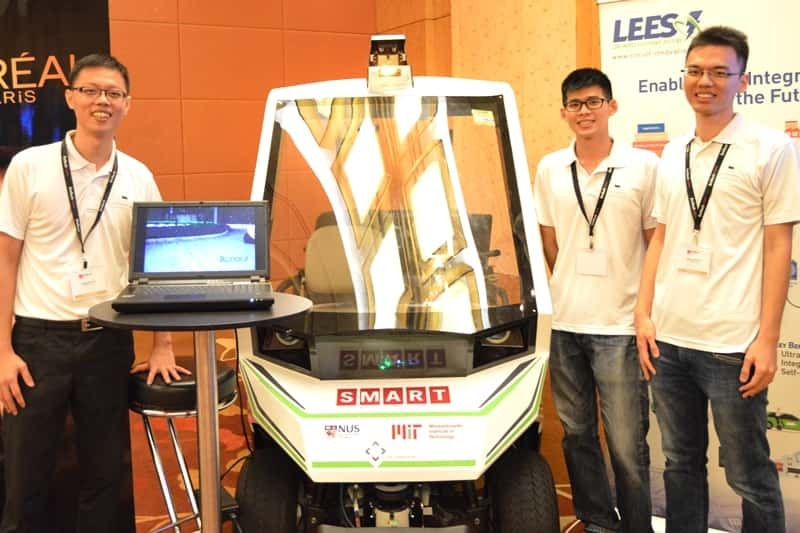 At EmTech Asia, the Singapore-MIT Alliance for Research and Technology (SMART) Future Urban Mobility (FM) Interdisciplinary Research Group (IRG) behind the Autonomous Vehicle (AV) at One-North, unveiled a new Autonomous Buggy. The objective of the SMART- NUS AV research project is to allow a fleet of AVs to provide Mobility-on-Demand (MoD).This will complement the existing transportation system, reducing the overall commuting time by solving the “first-and-last-mile” problem. This solution will thus reduce the traveling time from the starting location (for example, commuter’s house) to the start of the transportation network (for example, MRT station) and reduce the traveling time from the end of the transportation network to the final destination (for example, commuter’s workplace). The research integrates existing technologies with fresh methodologies to allow driverless vehicles to intelligently provide MoD, with the goal of making this future transportation paradigm a reality. A self-driving electric car is used to demonstrate the MoD system. OpenGov was told that during the testing of the vehicle, the FM IRG had the Buggy operate in the NUS UTown Plaza. This demonstrates that, without a road for travel, the Buggy is able to navigate with ease and without clear roads or signage. “This buggy is more suitable for places not accessible by cars, like Gardens by the Bay, Sentosa, and Private Roads,” emphasised Eng You Hong, member of the FM IRG. The design integrated the laser sensors right into the frame of the buggy. The Buggy aims to look less like a traditional golf cart and more like a unique AV, blending perfectly into the landscape. The front windscreen is larger and allows for wider open viewing and navigation. This is compared to the SCOT Vehicle– which has a somewhat obstructed view while it is in motion- and the earlier generation of the golf buggy used in the Chinese Garden trial. This new buggy represents what we might very well see in our future hybrid environment of transportation, as alluded to by SMART CEO Daniel Hastings. Beyond the work behind this buggy, the FM IRG will be working to convert other ‘vehicles’ to be autonomous, such as motorized scooters. This will contribute to the group’s aim to build an ecosystem of autonomous vehicles, serving a future of Mobility on Demand.